With 2013 just around the corner, BAIT is seizing the opportunity to celebrate the Year of the Snake with the exclusive BAIT Snake Starter Hats. To celebrate the upcoming turn of the Chinese calendar, the limited edition snapbacks recall the “original snake” – the serpent from the famous Adam and Eve creation myth. The hats feature a BAIT snake logo embossed on the front, designed after the serpent that tempted Adam and Eve to eat the forbidden fruit in the Garden of Eden. A premium snake material dresses the logo’s body and hat brim. An embossed serrated BAIT logo sits on the side while the Starter logo can be seen on the back. 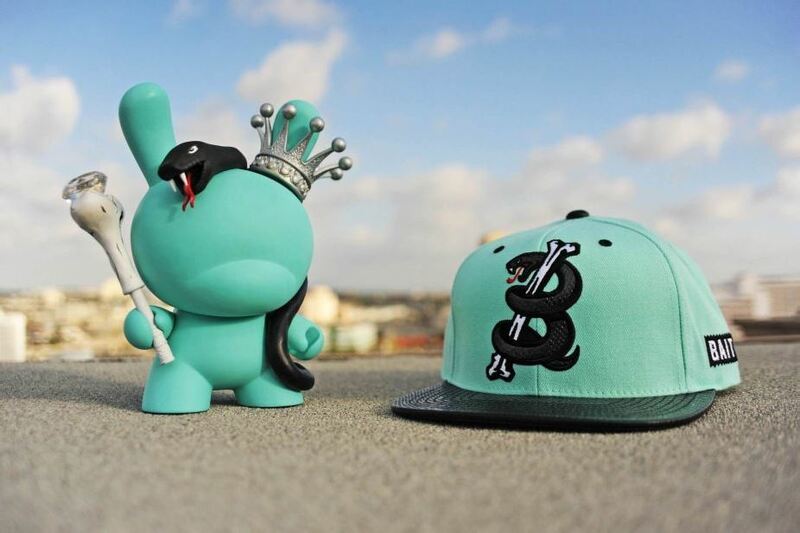 The hats are available in two colors – teal with black accents and black with silver accents. BAIT will release the limited BAIT Snake Starter snapbacks today October 24th, 2012 at our flagship store in Diamond Bar, CA, and at BAITme.com.